Need more information about booking Home 6766680 ? A Octeville sur Mer, living in the countryside, quiet. initial price for 1 chamber 2 people, SUS household and complementary chamber beyond 2 people. 1st floor, for you, Bathroom, toilet, 1 master bedroom 2 persons. A private dining room used as a bedroom with a sofa bed, 2 people. TV, DVD and corner simple restoration. On 2nd floor: 1 bedroom 2 additional people lumineuse.ne not suitable for children under 8 and elderly. No tenants other than those of the same family or the same group at the same time, whether you are 2 or more. By car: 20 minutes Etretat, Honfleur, 1 hour from Deauville, Rouen, Caen and landing beaches, 10 minutes from Le Havre (Unesco heritage). Train 1 hour from Rouen and Paris 2:00 feasible in 1 day. Great nearby attractions in Normandy and even Paris. 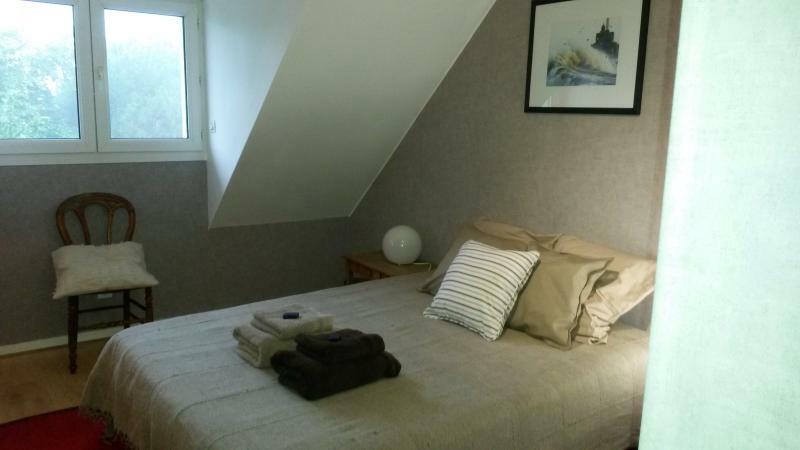 Accommodation in the countryside allowing walks and cycling (loan possible), fast access to the beaches of Le Havre and Sainte Adresse Octeville. Access on foot to the center of Octeville sur Mer including shops and its market Sunday morning. Large garden, sun terrace south, secure indoor parking, personal key access to the house and room. Possibility of breakfast extra (6 euros per person), taken in terrace or in your private room. Internet access, board games, DVDs, regional books, ping pong table available. Bedrooms, living room, snacks and mini terrace area are private, the private bathroom. The main kitchen will be shared according to schedules defined with you, for convenience. The main terrace and garden are available. Rental exclusively for a group or a family, together. Near Highways A13: Rouen, Paris and Caen, Mont Saint Michel. A29 Train station Le Havre all destinations to Gare Saint Lazare. Havre Tram covers the beach and the city center there. In total independence for you versus us, but with our help and advice if necessary. We are present for your arrival, presentation of places and departure. We will be happy to prepare breakfast taken in the room at a time that suits you. Tourist guides are available and we also, in respect of each other. Our tenants can benefit from a great freedom for the exclusive floor and in public places. We ask them to observe the scene, to return them in good condition. The operating rules are simple: Usability mutual respect. Some parts remain private for us and their privacy is preserved. Smokers can find a place dedicated to the outdoors. 1 small dog is accepted, please contact us before. You can get in touch with Frédéric et Françoise (the owner) through the contact form on this page. Send Frédéric et Françoise (the owner) an email through the contact form on this page. Alternatively, if there’s a phone number on this page, you can call them. How do I contact Frédéric et Françoise (the owner)? If you’ve already booked, go to Manage your holiday booking to view Frédéric et Françoise the owner's contact details or send them a message. Or send Frédéric et Françoise (the owner) an enquiry through the Contact the owner/manager form if you’d like a quote or more info first. When you pay online through the Book your stay form, a booking request is sent to Frédéric et Françoise (the owner). You’ll find out within 24 hours whether they’ve accepted - no money will leave your account before then. You can also request a quote from Frédéric et Françoise (the owner) through the contact form. The owner will email you the total cost for your dates and a link to book and pay online. Use the Book your stay form to pay provisionally online. You can pay by credit/debit card or PayPal. Frédéric et Françoise (the owner) will have 24 hours to accept the booking and no money will leave your account before then. Why can't I call Frédéric et Françoise (the owner) before booking? You’ll need to contact Frédéric et Françoise (the owner) to do this. Send them a message in Manage your holiday booking or through the contact form on this page. You can request to change the dates or number of people on your booking via the Manage your holiday booking page. To change your holiday dates use the Edit booking button. If you need to change the number of guests staying then send Frédéric et Françoise (the owner) a message. If Frédéric et Françoise (the owner) agrees, they’ll send you a revised quote outlining the changes. You can review and accept/decline this from the Manage your holiday booking page. You’ll have 48 hours to take action before the revised quote expires. Estimated price per night based on a weekly stay. Owner fees of $12.00 per stay may apply. Enter your dates to see the total cost.